It’s easy to get lost navigating the maze of tiny streets in the Beirut suburb of Bourj Hammoud. But ask anyone in the bustling neighborhood for directions to the Karagheusian Medico-Social Center, and it’s as though you are receiving a welcoming invitation to their home. For nearly 100 years, the clinic has been a landmark. It began serving the Armenian community at the beginning of the 20th century, reaching out to refugees who settled in Bourj Hammoud after fleeing the Ottoman massacres. Now Karagheusian also serves refugees from neighboring Syria. Since 2011, tiny Lebanon has absorbed more than one million people displaced from the Syrian conflict. At the clinic, a team of 40 rotating doctors, plus a staff of 40, serves 4,000 patients a month. Of those, 3,000 are Syrian refugees and 1,000 are from the Lebanese host community. About two-thirds of the clinic’s current beneficiaries are Muslim. On a typical morning, worn strollers are lined in a row outside near the entrance to the sunny yellow building that houses the center. Soon after, Vartouq is comforting a toddler girl who is crying pitifully during her vaccination shot. “You’re my sweetheart and you’re brave,” Vartouq reassures, gently holding a tiny hand in her own. “I like to help everybody. All are God’s children,” Vartouq says, as dozens of mothers with their children patiently wait their turn to meet with staff. This is the spirit that permeates the busy Karagheusian Center. The misery that the refugees carry from their catastrophic experiences seems to vanish as they enter the center, where they are welcomed with open arms. I was so touched by the loving care and support they receive. It is as if a huge weight has been lifted from their shoulders. Some months earlier, Dr. Salame had contacted CNEWA, offering to provide any service he could during his visit to his native Lebanon. That outreach led to Dr. Salame presenting a talk on back and neck pain for a group of some 150 Syrian Armenian Christian refugee women who gather each week as part of Karagheusian’s social service initiatives supported by CNEWA. After the talk, the doctor tirelessly met with 25 women for individual consultations. Karagheusian’s social services arm, which includes a team of eight social workers, is aimed at providing support and encouragement, to help both refugees and vulnerable members of the host community to live a dignified life. Those initiatives include home visits, after school tutorial programs, a summer camp for children, trauma therapy sessions, vocational training for women to learn income-generating skills and women’s empowerment groups. 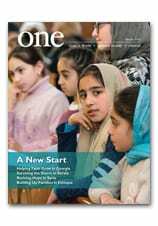 Read more about A Refuge in Lebanon in the December 2018 edition of ONE.